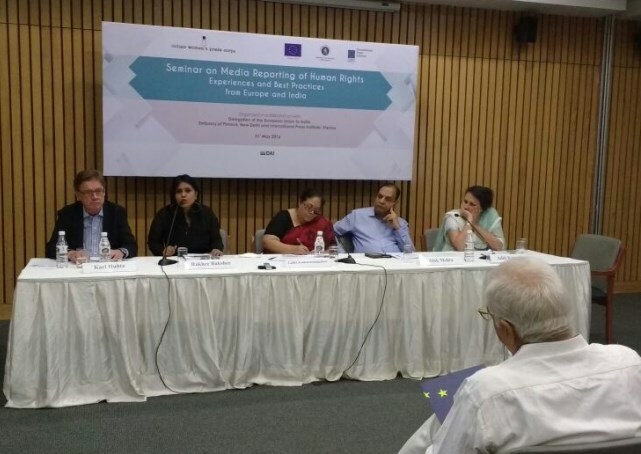 The Seminar on Media reporting of Human Rights, to address as well as to draw a convergence with the European experiences of on ground reality journalism took place on 31 May,2016 at Indian International Center, New Delhi and was hosted by the Indian Women’s Press Corps (IWPC). The first session of the seminar focused on Reporting from Crisis and Conflict Zones: Experiences from India and Europe. The Session was inaugurated by Mr N. Ravi who introduced the members of the sitting panels. He also threw light on the various problems faced by on ground reporters in the conflict zones. 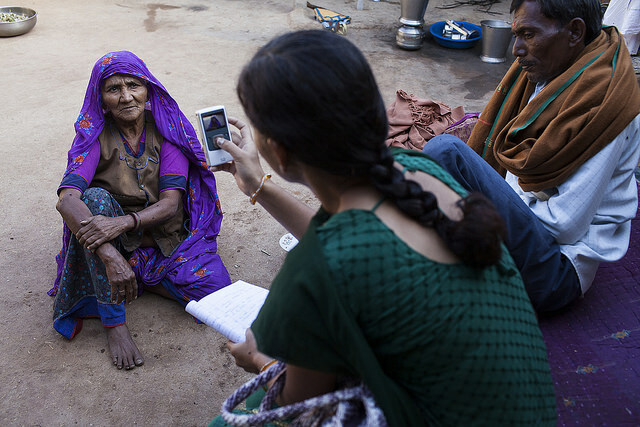 Indian journalists such as Maya Mirchandani, citing the example of the Chhattisgarh movement, pointed out the reluctance of the local tribes in the area to interact with any outsider. What was astonishing was the fact that the fear of governmental agencies ran deeper than the fear of the Naxal insurgents into the local population. The subject expert Suvojit Bagchi pointed out that the locals were stuck in the middle of the conflict between the insurgents and the local authority. Hence they were forced to comply with the demands on either side at times which aided their own protection. Finally Aasha Khasa, a senior journalist in Governance pointed out that it was not just extracting the information which was a Herculean task itself but the information had to be “adjusted” in a way that it went along with the facts and the content provided by the local agencies. For me, this violation to the expressive nature and the threats attached to it were the major reasons of discontent among the journalist. The next session focused on Media Support for Human Rights: Towards a More Inclusive Society. It kicked off with the infamous JNU issue. Here it seemed it was not the actual intolerance but the intentional or forced ignorance through political pressure on media gained heat. As Coomi Kapoor, an independent journalist pointed out, journalism and free press were – by extension of freedom of speech and expression – part of human rights itself. Here it was again and again brought up how cases were portrayed in accordance to the governmental authority and/ or the cases which were expected to bring more popularity to the media houses were covered. As a result not all that happened usually gets reported and hence “the honest eye witness” nature of journalism, as quoted by Pamela Philipose, is often compromised. Finally Vrinda Grover a senior lawyer in the Supreme Court of India pointed out various instances where the major publications depended solely on the reports of various governmental agencies in their content formation. She ended this round with a positive note citing examples where the media was more successful in finding the real story than the governmental agencies. The next round and perhaps the most intriguing one was Friends or Foes: Women and Media. It broadly captured two issues: women in media houses, and the cases of women exploitation recorded by the media. Addressing the issue of women in Mmedia houses, Rakhee Bakshee pointed out that in order to survive in the media business, women had to work twice as hard as men. Further, even at the position of power, a women’s ability was always under the question in the sense that the reason why she was successful was because of her “sexual prowess” rather than her abilities. It was then pointed out that the situation is much worse in smaller cities. A contradictory say in the panel emerged when Alok Mehta, Editor in Chief of The Outlook (Hindi) pointed out that it wasn’t just men who threatened the situation of women in the workplace but it was the women who threatened each other as well. He went ahead and asserted that the situation is much worse in Hindi and other regional lingual media houses than in English newspapers. One of the points which I found particularly impractical and implausible was that he said that women should empower themselves enough to start their own publications. Finally Aditi Kapoor, a developmental journalist and reporter shared her own experience from the time when her promotion was compromised due to her pregnancy in one of the leading newspapers of the country. She pointed out how statistics have not shown any transformative improvements in past two decades. She also asserted on the point that while the presence of women in media cannot be ignored but the cases handled by the media regarding the women exploitation were negligible compared to the number of occurrences of such cases. The concluding panel, which proved the most intense, was Press Freedom, Media Ethics and Governance. Although the question of political pressure on media was raised throughout the seminar, its final verse concluded here. Madhu Trehan, the most straightforward journalist of the day, brusquely stated her work experience in media from Nehru to present and simply stated that restrictions mentioned in Article 19 are defamation, contempt of court, decency or morality, are simply because Nehru could not handle the post independent trauma on his self-image inflicted on him by the Indian Press. She then went ahead and stated that the paid media profession was not initiated by the politicians but the journalists themselves. One of the most enlightened points that she made was that dissent is much easier in a dictatorship since dissent can be justified by giving the example of Indra Gandhi’s emergency. She stated that protesting was simpler because the oppression of the press was in the open and it was easy to openly revolt. She concluded by commenting on the defaming of the Indian journalism due to the paid media as well as “under the table” dealings of the governmental pressure. She then handed the podium to Raj Chengappa, President of the editors guild by questioning about his own dealings with the governmental pressure. Mr Chengappa began by explaining why various journalists and media houses had to indulge in the paid “business” aspect of media. In a couple of seconds it become very clear that it was the lack of revenue and funds of media which forced them to indulge in the paid portrayed news business. A major concerns of the panel was the emergence of social media. It seemed that despite its all reaching aspects, the wide range of social networks and news blogs have intensified the competition and made it tough for a journalist, or as a matter of fact even the huge media houses, to fund themselves. The seminar concluded on the note that there are serious forces in motion which have resulted in the loss of credibility of the Indian media. The perception of media among common people is changing and instead of the reporting nature of the media it is now being perceived as a consumer based industry. Top image by Video Volunteers. In-text image by the author. News stories that report on these issues may cause the victim to be re-victimized by reading or hearing about the case. A very well covered conference.The writers views on the subject is informative. Human rights are universal and belong to everyone equally. The origin of Principles One and Two is in the 1948 Universal Declaration of Human Rights (UDHR). The aim of this Declaration was to set basic minimum international standards for the protection of the rights and freedoms of the individual. The fundamental nature of these provisions means that they are now widely regarded as forming a foundation of international law. In particular, the principles of the UDHR are considered to be international customary law and do not require signature or ratification by the state to be recognized as a legal standard.